Students in Alpha Phi Omega touch lives, improve communities and change the world in many ways, large and small. And in the process, they discover and hone their leadership skills and make lifelong friendships. They leave college better prepared to be leaders in making the world a better place in which to make a living and life. We need to help them. We need more of them. We need them to be on more campuses. We need to do more to empower them to become Leaders in Service. That is what the Leaders in Service Campaign is all about. THANK YOU to our generous supporters for making the Leaders in Service Campaign a success! 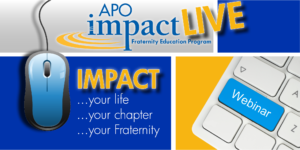 Stay tuned for more information about the impact that Alpha Phi Omega students are making because of your commitments!